It’s good practice to always use a version control system in any of your projects. Be it a side-project in which you are the only developer, or a team project where five or more people are working on it together. But the idea of putting your database into version control isn’t really that widespread. Often times we take the database for granted. But like the source files in our project, the database is constantly changing too. That’s why we also need a way to track the changes that we have made and easily share it to other members of our team. In this article we will take a look at DBV, a database version control system written in PHP for MySQL databases so you need to have PHP and MySQL installed before you can use it, along with a web server like Apache or Nginx. An important note about this software is that it is not a stand-alone database version control system, because it needs a version control system such as Git, Mercurial or SVN for syncing changes with your team. An alternative approach is just cloning from Github. 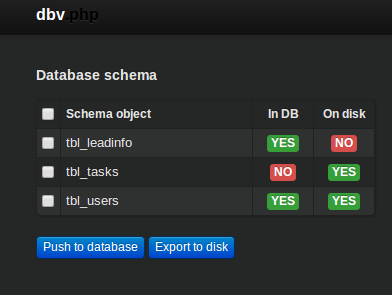 You can start configuring the options for DBV by creating a copy of the config.php.sample file and renaming it to config.php. The first section in the configuration file above is all about the MySQL database details in your machine. The second section are the login details for dbv itself. These are the files that will be ignored by Git. But if you know that you have the same database information (user, password, database name) as your team mates then you can remove config.php from the .gitignore file. If not then they will have to create their own configuration file and exclude it from source control. Next you also have to add the data/meta/revision file to .gitignore as that is where dbv puts information about your local copy of the database. It might be different for your team mates so it needs to be excluded from source control. git commit -m "add dbv into project"
What Changes To Keep Track Of? Or if you defined a virtual host, by accessing its URL. From the screenshot above you will see the tables that are currently in the database that you supplied in the config.php earlier. There’s also an In DB field that displays whether a specific table is currently in the database and the On disk which displays whether the current table is saved in your filesystem. With this information you’re pretty much aware whether you currently have the latest copy of the database. An important thing to remember when working with dbv is that any changes you make to your local copy of your database should have a local copy that you can commit into your source control. git commit -m "add tbl_task table"
At this point you can just tell to your team mates that you have created a new table in the database and that you have already pushed it to the central repo. Now they can just pull it down to their local copy. Next tell your team mate to visit the dbv page (http://localhost/your_project/dbv). At this point he can just tick the checkbox next to the tbl_tasks table and click on the ‘Push to database’ button. This will create the tbl_tasks table in the database. And that’s the workflow for working with dbv. Pretty easy, isn’t it? But what if you need to make changes to the current database schema? Maybe you missed a field or forgot to add it on a specific table before you distributed it to your team. That’s where revisions come in. If you’re like me and you tried updating the schema (added a new field, remove a field, updated the data type, etc.) for a specific table you might have noticed that dbv isn’t aware of it by default. For those changes you need to create a revision file. You can do that by creating a new folder in the data/revisions directory in your dbv installation. The convention for naming the folder is making use of a number. So the first time you make a revision the folder name would be 1 and then the next time it would be 2 and so on. Note that revisions are changes that can be applied to the whole database. This means that you have the freedom to modify the structure of more than one table, but its good practice to only make changes to a single table and make a revision for it. This is for you and your team to easily manage the changes and make sense of it later on. The only exception to this practice is when the changes are related to each other. In that case it would make sense to put those changes together in one revision. Next create a new file in the data/revisions/1 directory in your dbv installation and put the query that you just executed as the contents. Name the file tbl_users.sql. The convention here is using the name of the modified table as the name for the revision file. If you are making modifications to more than one table then create a separate file for each table. git commit -m "add email field to tbl_users"
Again you can inform your team mates about the particular change. Communication is key when making changes to the database. You want to make sure that everyone on your team is on the same page as you. DBV is a nice way to easily manage your database version control needs. It lets you and your team easily keep track of the changes made in your database. It also allows for easy sharing of your changes with the rest of your team through the use of Git. This ensures that everyone always has the latest copy of the database. In this article we have looked at using DBV with Git but you can pretty much use any version control system of your choice. Feedback? Please leave it in the comments below!